When you think of intelligent non-human animals, you probably think of apes: they use tools, appear to have culture, can be taught language-like communication systems, and the list of uniquely human traits seems to be ever-shrinking thanks to them. Maybe you include dolphins in your list of smart animals. When asked to imagine intelligence in the animal kingdom, it’s unlikely that the critters coming to mind would be octopuses, fish, birds or insects. But as a recent Scientific American article on comparative cognition points out, some branches of the tree of life that don’t normally get a lot of attention for their smarts have actually demonstrated some pretty impressive abilities. In the sea, cephalopods (octopuses, squid, cuttlefish) are the mental badasses of the invertebrates. 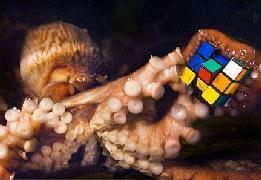 Octopuses, for example, are not only great problem solvers, but can learn to solve a problem simply from watching other octopuses do a task. Fish may be smarter than we give them credit for. Goldfish, for example, can orient their way through mazes (more efficiently than slime-mold, even). So can reptiles like turtles. Calling someone a bird-brain may be an insult, but it turns out some birds are pretty smart. New Caledonian crows create and use fairly sophisticated tools to access out-of-reach foods, and other crow group members learn the tool trade from the experts. They appear to reason causally. Scrub jays appear to have something like episodic memory — those memories you have of experiencing a personal event, as opposed to simply remembering a fact. They seem to remember specific events when they put a particular food item in a certain place, and how long ago they did so. They also appear to plan for the future. Birds aren’t the only ones unexpectedly using tools: adorable rodents called degus can learn to use tools in a way that demonstrates some understanding of how the tool works. Researchers recently demonstrated metacognition in rats — rodents that seemed to monitor their own state of knowledge and act based on what they did or didn’t know. The same lab showed episodic-like memory in rats, similar to that seen in the scrub jays described above. Some dogs can learn new words almost as fast as human toddlers, hearing a word a couple times and associating it with a particular thing. They can even figure out the link between objects and pictures of those same objects. In fact, a 2008 study showed that a dog can use a lexigram board to make communicative requests to a human owner, much like some apes have been taught. Elephants show mirror self-recognition, a feat previously demonstrated in primates and dolphins. They seem pretty smart overall, and seem to be taking a place along with primates and dolphins in the popular imagination as brilliant animals. Meanwhile, at a much smaller level, intelligent swarm behavior in insects such as ants emerges despite individual ants being pretty simple; it’s hard to predict such complex and elegant colony-level problem solving from an individual ant’s behavior. Individual ants show some pretty interesting behaviors as well, though; something perhaps akin to teaching. When “tandem running”, one ant leads a follower by maintaining antennal contact, stopping when it loses contact, waiting each time the follower stops to make small loops to search for landmarks, slowing for the follower to catch up, etc. None of these behavior happens when the same ant is going to the goal alone. These are just a handful of random examples of intelligence found in the animal kingdom outside of the usual places. These examples serve to highlight that intelligence didn’t develop in a linear progression up to monkeys then apes then humans, but rather has developed across many different taxa (groupings), with species often reflecting an intelligence uniquely adapted to their evolutionary environment. In some ways, they share a lot with us — so many previously ‘unique’ human cognitive characteristics have now been found across different orders of animal — but they also demonstrate their own brand of intelligence that reflects their ecology and evolutionary history. This entry was posted in Uncategorized and tagged behavior, cognition, science. Bookmark the permalink.